I don’t like the cold. My dog doesn’t like the cold. But she loves running in the woods. We often walk in the woods, along a gas line that separates my neighborhood from a park because no one can see us. Here on this informal trail, Ayla runs off-leash and we’re less likely to be caught. On the rare occurrences, we do see other people or dogs, I hook her up real fast and we pretend to be morally righteous law-abiding citizens until we pass them by. In the winter, I try to walk this route at least once a day since she can do double-time in exercise when she’s loose and she loves chasing squirrels. I do use an ecollar in order to allow her to roam. It gives her more freedom, but allows me to enforce a recall if need be. Most of the time, I don’t have to use that power because she knows how it works and will respect that even if she’s in the middle of chasing some critter, I said come or used the tone, so she comes. So everyday we walk in the woods. If I manage to get home before dark, we’re usually walking in last dregs of evening light and since we’re walking in woods that have been ear-marked for bow hunting, I carry a lighted red lantern (a sweet Christmas present from my Mom last year) and she wears a neon yellow vest and a green glow-stick collar. 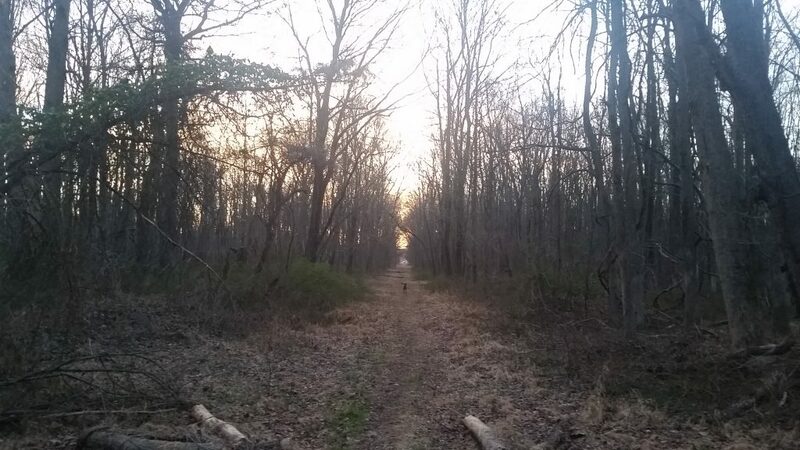 I walk the woods as long as there is just enough light to see between the trees – mostly because I know there are at least one coyote in the area and that it has attacked a (small) dog before. I don’t worry about foxes and Ayla, but a coyote would be about her size, and I don’t know who’d win, so I’d rather not even risk it. In the cold, in the night, in the trees isn’t my favorite time though. I prefer walking in the morning. Don’t get me wrong. Mornings are usually colder. 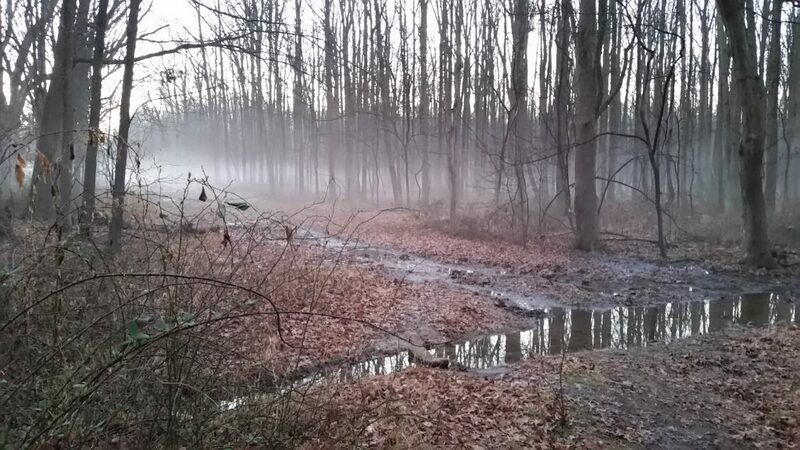 I’m very often a mist puffing dragon when I walk the morning trail. But there is something very soothing about being in the woods, in the morning, before the sun has risen. The shadows fade quicker, even if the sky is only lightly painted pink. The woods are silent, and the forest is such a unique color. All the gray trees pick up the pink tint of the sky and it’s quite lovely. I live with general anxiety. My vice is overthinking everything. Most people don’t pick up on it, because I’m friendly and social. They often confuse me as an extrovert. But I’m not. I’m simply a chatty introvert and even then, I had to teach myself how to do that and make small talk with strangers. I can’t telecommute because it makes me too lonely, but being around people (even if I’m wearing headphones, working on a computer, and not really talking to anyone) wears me out. 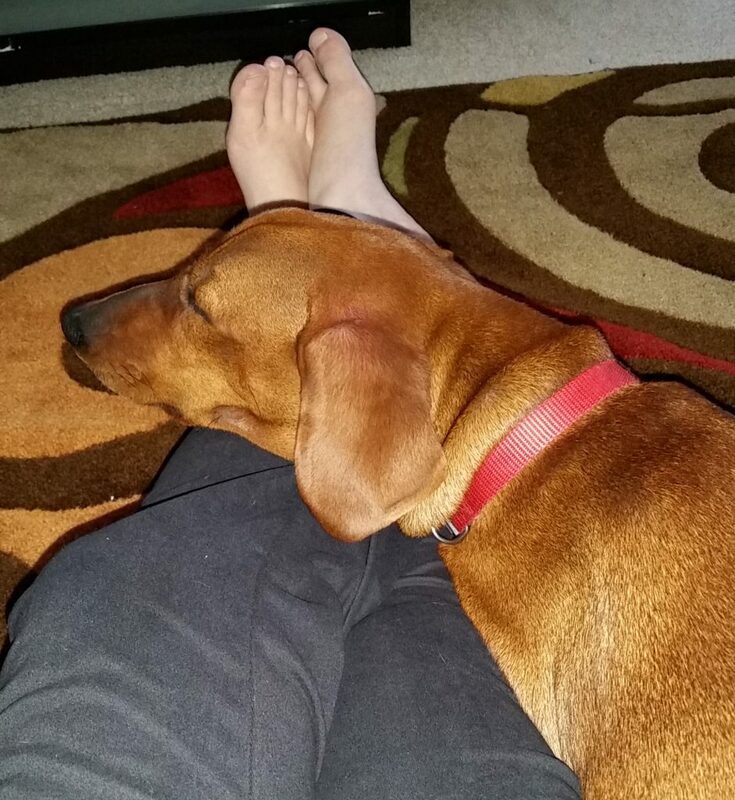 At the end of a work day, all I really want to do is curl up with my dog and watch television. My anxiety is not social anxiety. I don’t mind public speaking or potlucks with strangers. I am grateful Meetup exists and I wouldn’t have found half my friends without it. My anxiety is more subtle. It wants to smooth the choppy seas for others’, but without falling out of the boat or giving up control of the steering wheel. I’m highly sensitive and also an empath, so I often pick up others’ emotions and feel them quite strongly. In the same vein, I get overstimulated very easily. Crowds, public transportation, city noise, places that have constant sounds, movement, lights…I really can’t stand being caught up in it for very long. I have a very hard time in airports. I had to face that for work, and it was a challenge. I still don’t like doing it much at all and I rarely travel unless I can drive it. I had a therapist once who suggested mediation. At the time, I kind of dismissed it. I had tried Yoga and found breathing exercises didn’t really seem to help. I’ve since come to realize that I do mediate. But I do it in my own way, which is walking my dog in nature, away from traffic, by myself. I’ve found that I’m not really thinking over anything in my mind when I walk her. I breathe the cold air and focus on my dog as I walk. I watch my dog as she paces, her rib-cage bobbing right and left. I watch as she does a little skip, delighted to smell something, and while trying to wag her tail, ends up wagging her whole rump. 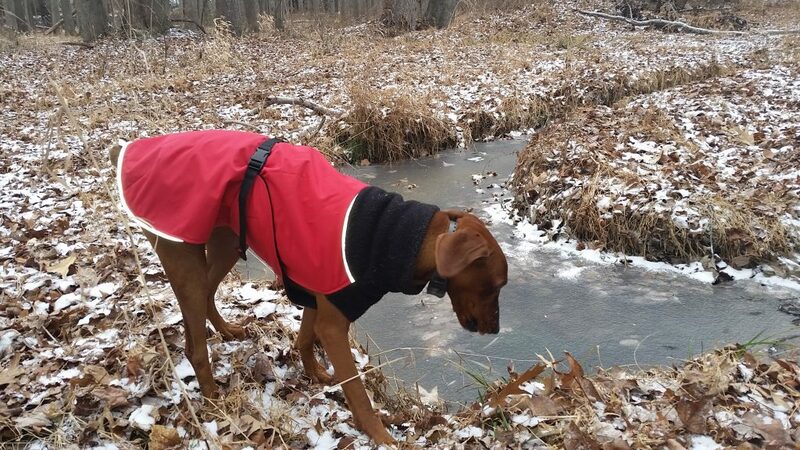 We walk along a partially frozen stream and I stop to stare out into the gray tree trunks into the silence. Nothing moves except my little red dog, in her little red coat and I let her fade out from my vision. The horizon is a sliver of pink that begins to spread across the sky. Standing there in the chill dawn of the forest, sometimes I forget that winter is not my season.